The Dangers of DIY Plumbing. With the advent of modern plastic materials and the proliferation of ‘how to do it’ videos on You Tube, many people are tempted to try their hand at plumbing jobs around the home, often with disastrous consequences. 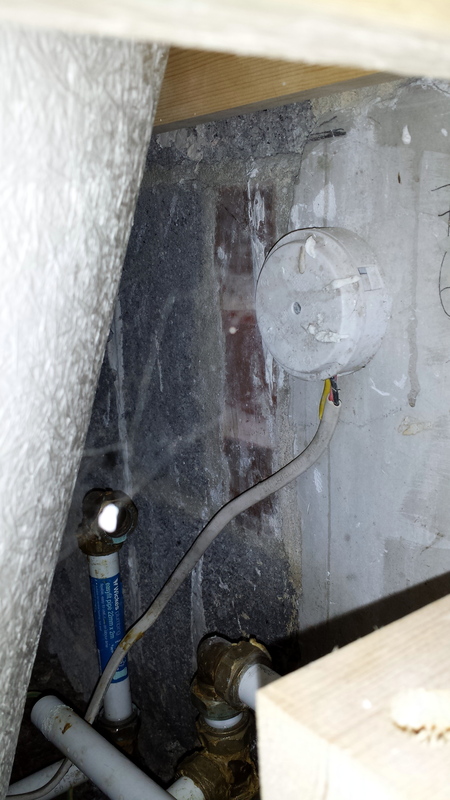 This picture taken under a bath illustrates an incorrect compression joint made on plastic pipe. The white pipe in the bottom of the picture has come adrift from the elbow on the vertical pipe with the blue label. There was no insert in the plastic pipe and signs that ‘Boss White’ or a similar compound had been used on the joint. The occupant of the property was awoken at 2.00am on a Saturday morning by the sound of her kitchen ceiling crashing down and water pouring through. If this job had been done correctly it would have cost a fraction of the amount the owner has now had to spend to put it right. With a small baby in the house the consequences could have been much worse if this had happened during the day. Is it really worth the risk of trying to do your own plumbing?